Washington, DC (Thursday, April 21, 2016): U. S. economic activity continued to slow dramatically in the 4th quarter 2015, threatening recession. As a whole, the growth rate of the economy was anemic, almost flat, for 2015. Gross output (GO), the new measure of total U. S. economic activity published by the Bureau of Economic Analysis, showed that spending throughout the economy declined slightly in the 4th quarter of 2015. 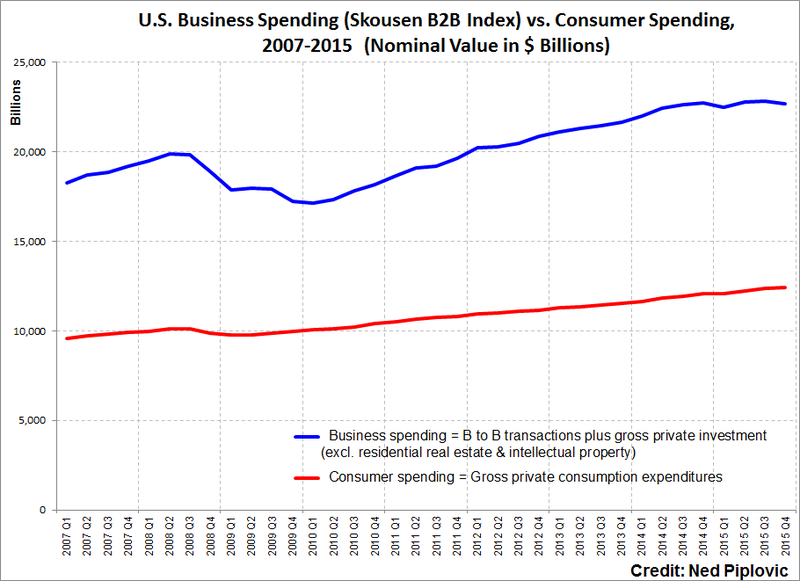 And the Skousen B2B Index — a measure of business spending throughout the supply chain — has now fallen two quarters in a row. Both data suggest a mild business recession as we entered 2016. Based on data released today by the BEA and adjusted to include all sales throughout the production process, nominal GO fell 0.6% in the 4th quarter of 2015, compared to an increase in the 3rd quarter (+2.3%). Adjusted GO was $39.0 trillion in the 4th quarter, more than double the size of GDP ($18.2 trillion), which measures final output only. Nominal GDP actually rose 2.3% in the 4th quarter. 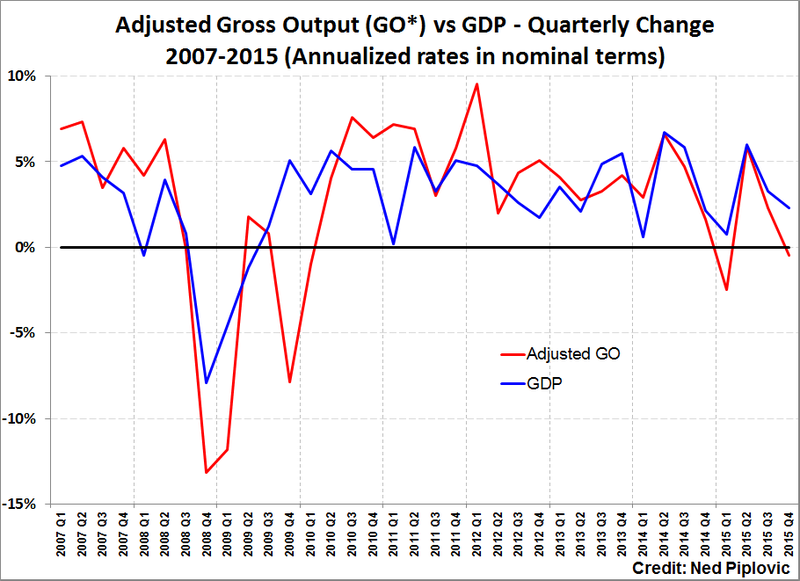 When GO declines relatively to GDP, it’s usually a sign of recession. Deflationary pressure on prices continued in the 4th quarter, so that in real terms, the adjusted GO growth rate rose slightly. But the rise in real GO (+0.8%) was less than the growth in real GDP (+1.4%). Supply chain activity varied significantly in the 4th quarter, with continued declines in early-stage production: Mining activity fell by 11.4% and manufacturing declined by 2%. Gainers were led by information, finance, real estate, rental, and leasing, but they were not enough to compensate for the losses in the early stages. Wholesale and retail sectors also fell by 1.6%. GO and GDP are complementary statistics in national income accounting. Gross output (GO) is an attempt to measure the “make” economy; i.e., total economic activity at all stages of production, similar to the “top line” (revenues/sales) of a financial accounting statement. In April, 2014, the BEA began to measure GO on a quarterly basis along with GDP. GO tends to be more sensitive to the business cycle, and more volatile, than GDP. During the financial crisis of 2008-09, GO fell much faster than GDP, and afterwards, recovered more quickly than GDP. Still, it wasn’t until late 2013 that GO fully recovered from its peak in 2007. The fact that the adjusted GO is now falling faster than GDP growth suggests that the economic recovery is losing steam as we enter 2016. We have also created a new business-to-business (B2B) index based on GO data. It measures all the business spending in the supply chain and new private capital investment. Nominal B2B activity fell 0.8% from the previous 3rd quarter to $22.7 trillion. In real terms, B2B fell 1.0%. Meanwhile, consumer spending rose 0.6% to $12.4 trillion in Q4 (+0.3% in real terms). Note: Ned Piplovic assisted by providing technical data for this release. Friday, May 13, Washington, DC, 11:00 am – 1 pm ET. To register, go to http://www.cato.org/events/go-beyond-gdp-what-really-drives-economy. Or email events@cato.org or call (202) 789-5229. If you can’t make it, you can see this event live by going to www.cato.org/live. To interview Dr. Mark Skousen on this press release, contact him at mskousen@chapman.edu, or Ned Piplovic, Media Relations, at skousenpub@gmail.com. The BEA currently uses a limited measure of total sales of goods and services in the production process. Once products are fabricated and packaged at the manufacturing stage, the BEA’s GO only adds “net” sales at the wholesale and retail level. Its official GO for the 2015 3rd quarter is $31.6 trillion. But by including gross sales at the wholesale and retail level, the adjusted GO is $39.0 trillion at the end of 2015. Thus, the BEA omits $7.5 trillion in business-to-business (B2B) transactions in its GO statistics. We include them as a legitimate economic activity that should be accounted for in GO, which we call Adjusted GO. See the new introduction to Mark Skousen, The Structure of Production, 3rd ed. (New York University Press, 2015), pp. xv-xvi. The GO does seem to be a much better figure than the GDP,but would it be nice if the federal would not be involved with developing economic statistics .